You can find Rahel Ethiopian Vegan Dishes in most Los Angeles area Whole Foods Stores, Erewhon Natural Foods Market at The Grove & many other local specialty food stores, complete list below. Whole Foods Stores Link to Whole Foods website, listing local stores & directions. So today we’re talking about quickies. And by quickies I mean, quick, on-the-go, readily available, delicious vegan meals. What did you think I meant? More specifically, I am going to rave and rant about the companies/restaurants that distribute meals such as the one that is pictured above. For the 5 people that actually read my blog, if you happen to remember a previous post that I wrote about Ethiopian food, then you know how good I think it is. 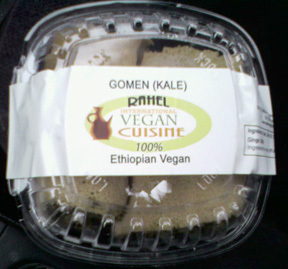 Imagine my surprise and enthusiasm when I saw that vegan Ethiopian food to-go was available at certain stores!!!? There is a god!!! Gods and deities aside, I found this lovely gem of a finding when I was at a Westside grocery store [but of course]. If you don’t know about The Co-op, now you know suckas! The Co-op is the ishhhhhhhhhhhhh. Honestly, for certain things, I love The Co-op even more than the more widely known health/grocery store chains such as Whole Foods and Trader Joe’s. The Co-op is located on Broadway in Santa Monica, between 15th and 16th street I believe. Here’s a link to their website: The Co-op! Anyway, they are also one of the only places that I’m aware of that carry lines of fresh vegan cuisine meals from places like Rahel Ethiopian or Leaf! They also carry a lot of other brands of conscious goods that other places do not have. So if you’re ever in the area, give it a go! On to the actual FOOD…damn, it was great. As some of you might know, Rahel Ethiopian is located on the same strip of Fairfax in Little Ethiopia, along side of restaurants such as Messob. However, as some of you may or may not know, Rahel has a specifically all vegan cuisine! And luckily, thanks to places like The Co-op, you can have delicious, exotic, vegan meals on-the-go! Ya’ll know how L.A. can get…it can get hectic. I must admit, I have been one to eat in my car while driving! 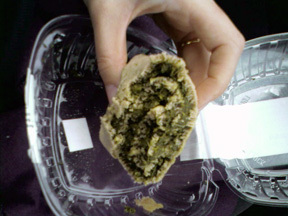 :X How unsatisfying in so many ways…but the redeeming factor here is that it was actually GOOD VEGAN TO-GO FOOD. 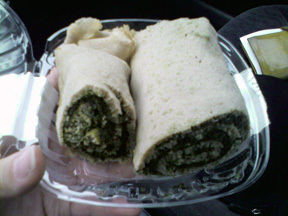 No, it wasn’t a sloppy disgusting McQuarter pounder or something posing as a “healthy” wrap alternative that some fast-food chains carry…it was Rahel Vegan Ethiopian Cuisine! It was something delicious and healthy and had kale in it! Can you really imagine a fast-food place carrying something that contained kale??! Yeah I can’t. Man, seriously, why haven’t more places caught on to this idea? Helloooo! Vegetarians and vegans need fast-food love too!! Any persons reading this post, I’m coining this idea NOW. Hollerrrrr. All You Can Eat Lunch Buffet - 11am - 3pm, 7 Days a Week. 10 Different Dishes. Copyright © 2010 rahel.com, Inc. All Rights Reserved.